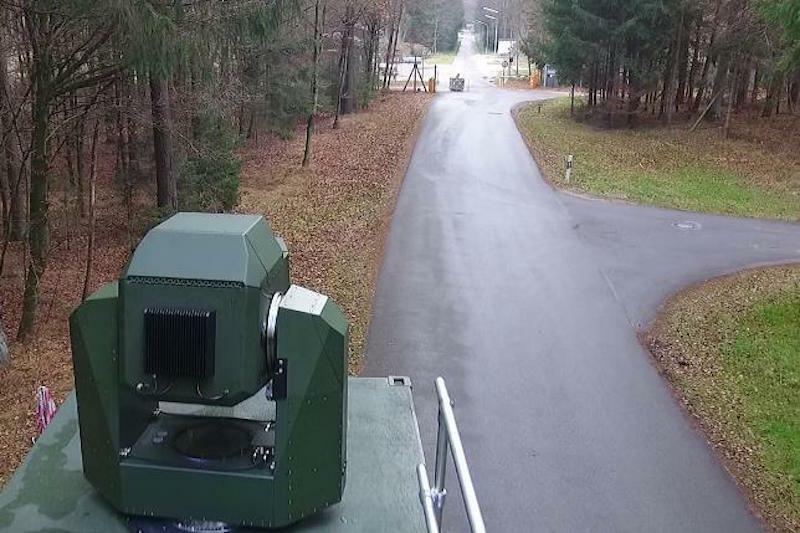 During the last three months, the headquarters of MBDA Germany at Schrobenhausen has been the venue for an extensive laser test campaign. The laser team tested a new illumination system, in an eye-safe range of wavelengths, in the system demonstrator, and conducted tests to demonstrate the performance and precision of the tracking system. The new laser illuminator, in the eye-safe short-wave infrared range of wavelengths, replaces the previous green laser target illuminator, and thus avoids any risks to the eyesight of users and uninvolved third parties. Once the eye safe was metrologically verified, the team successfully tested the gated viewing functionality of the new illuminator. This is a special kind of active illuminator that allows observations of radiation only when reflected by a highly specific range of distances. In particular, the options to isolate the target from the background, image quality, system performance, and tracking capabilities for dynamic, approaching or departing targets were examined. In order to verify the interference suppression in case of visual obstruction, the team used a fog machine set up between the demonstrator and the target. Even in this difficult configuration, the demonstrator was able to reach the target. This also makes it possible to discover and pursue targets that cannot be in visible wavelengths without this technology, making an important contribution to improving the all-weather capability of the laser system. In further trials, the system demonstrator tracked rapidly maneuvering drones to verify advanced image processing algorithms for fine tracking. In order to measure breakpoint stability, the spot of the high-energy pilot laser was recorded by instrumentation on the target. "The accuracy achieved during the tests fully met our expectations," said Dr. Gerhard Elsbacher, Head of Engineering and Operations Germany. "Due to the eye-safe laser illuminator, we were also able to test, for the first time in Schrobenhausen, against a blue sky as background. This allowed us to successfully reach our milestone. " At the conclusion of the test series, the team achieved another highlight: for the first time, a high-energy laser was successfully used as system demonstrator for a container-mounted, counter-drone demonstrator. "The successful test campaign is an important step for us on the way to the final product. During the experiments, new insights into the system as well as important aspects for the next steps can be investigated," said Peter Heilmeier, Head of Sales and Business Development Germany.